Have you heard the story about a jar, rocks, and sand? 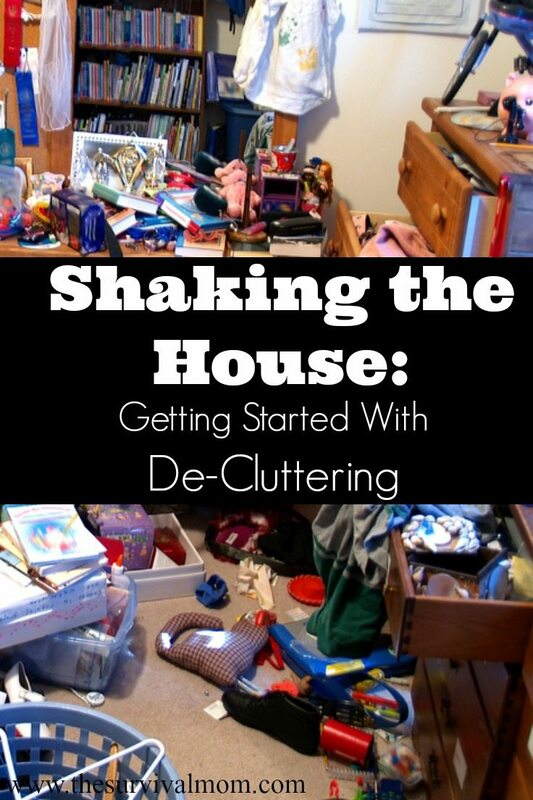 It’s a great life lesson about setting priorities and is a great demonstration of getting started with decluttering. If you put the sand in, then the small rocks, then the medium rocks, you run out of room long before you get to the bigger rocks. But if you start with the bigger rocks, everything will fit in because they slide around each other and fill every last bit of space. Here’s a great video illustrating this. When you think about it, getting started with deluttering is much the same as this illustration. Whenever I start cleaning, decluttering, and organizing, I say I’m “shaking the house”, in reference to the way you would shake that jar with rocks and sand to get every last thing to fit in. It can be a pain, and it’s definitely a chore, but it’s worth it. Pick a specific area to work in. The example used here is the kitchen, but substitute “closet”, “bedroom”, “laundry room” and the plan works for just about everywhere else. You are looking to priorities items that are most important and frequently used to those that are never used, are broken, dated, worn out, or otherwise useless but still taking up space. Take out everything so you can see it all at once. Start pulling items you no longer need or use, or that are duplicates you don’t need. Put them in a box, or take them out of the room. You may need more than one of some items, and that’s okay. No one is saying only keep one plate or one pot! But if you have extra plastic plates left from when your kids (now in middle school) were toddlers, toss ’em in the box. Pick out things you use rarely but regularly, at least a couple of times a year, such as a gravy boat, and put them into the hardest to reach cabinets. You have them on hand for the times when you really need that specialty item or, perhaps, an item with sentimental value, but it isn’t taking up space in areas that are easiest to access. Now take the things you use most and put them in the cabinet, drawer, or shelf most convenient to where you use them. Our dishes are close to the dishwasher to make emptying it go faster. I keep pots and pans just a step or two away from my stove. As you put them away, evaluate whether you really need them all or if you can let some go. Now look at what is left and evaluate them according to these questions. Your answers will help you evaluate each item. It may be very hard to make some of these decisions, and in those cases, if you have the room, I recommend keeping the item. You can always decide what to do with it later. When will I get around to finishing it? If I do need it down the road, how much will it cost to replace it? Organize what is left in a way that makes sense to the person who uses it the most, whether that’s you, the kids, or your spouse. Then put it away with their help (if possible) – again, trying to keep things near where they are most likely to be used, whenever possible. The basic idea is to find every single item you really don’t need, want, or use – no matter how small – and get rid of them all. Don’t focus on the size of items or getting rid of “all” of something. If you have a set of 12 wine glass but now only use 4, get rid of 8 and keep the four. Don’t worry about the fact that they are a “set” – just let it go and keep what you use. How is that different from what you are usually told? Not much, but here’s the thing: even getting rid of single items – one coffee cup, one old board game, one unused throw pillow – can make a difference when you add it all up. If you think about it, just those three items would fill up a fairly standard size box. Not a big one – but that’s only three items, and you can probably find more than that in your home. That gives you either plain old empty space to enjoy, or space to put other things away so there is less clutter out and visible. Either way, it’s a win. Sticking with the kitchen, since it is a common area that accumulates gadgets and things you don’t need, if you don’t ever use your blender, why do you keep it? A stick blender is much smaller and might be all you need, and it’s cheap. Personally, I use either a whisk or a pastry blender for almost everything most people use a mixer for, so I don’t need a big fancy mixer. Other people use theirs almost daily. Don’t keep appliances because everyone else uses them or you might use them someday. Keep them because you use them, now. Once you have looked over your appliances, move on to the pots, pans, casserole dishes, etc. If you notice you have three casserole dishes but you don’t really use them often, pick your favorite and put the others in a box with the appliances you’ve already selected to give away or sell. Don’t forget to toss the owner’s manuals, if you still have them! It opens up a little more space in your home, and useful for the new owner. Look at your serving dishes – the gravy bowl, platters, soup tureens, and all those other specialty items, even the electric carving knife. Do you still use them? If so, great! If not…box ’em up. The same for your cups, plates, bowls, and utensils (for eating, serving, and cooking). If you don’t use them all, get rid of what you no longer need. Finally, look for items in the hard to reach cupboards that none of us really use. Maybe yours contain personalized goblets you received as a wedding gift . Do you seriously still care about those or the personalized plate with your wedding date that has never ever been out of that over-the-fridge cupboard? Trust me, I know it may be hard, but just let it go. I kept the unity candle from our wedding for 15 years. Why?? I vaguely remember using an electric can opener when I was in high school (or maybe junior high? ), but I have never owned one myself. A hand-held can opener is easier to wash, a good one lasts a LONG time, and they can be used camping or when the power goes out, if you’re used to an electric can opener. It also doesn’t need any counter space. Likewise, an electric carving knife has never really made sense to me for healthy people. Do you still need a VCR and VCR rewinder? (Remember those? Is one hiding in the basement?) How about the DVD player you replaced with a BluRay three years ago? The same DVD player that is now almost ten years old, and four times the size of a comparable new one that costs under $100? Set those aside to donate to a thrift shop. How much does your house cost? We used to live in Los Angeles and at one point, our house was worth over $500 per square foot. (Nope, not a typo, and that’s not the dollar amount when we bought it.) That meant that buying a Little People toy for the kids was $30 or so for the toy, plus $750 in space in our house! That made it nearly an $800 toy, which was far more than I was willing to pay for it. Your housing (and ours, now) is probably far less expensive, but even if it’s $100 per square foot, is that old chair you are keeping because, well, you aren’t quite sure why, really worth $400+ in home space to you? Or could you dump it and buy a chair you actually like later, if you ever actually need it? The cold hard fact is that there is cost involved when it comes to clutter. You need a bigger and bigger house to hold it all. Sometimes it is worth it. I stand by my choice to stuff a closet with cardboard boxes of my son’s clothing to keep for my younger son, but I am ruthless about donating anything they outgrow to charity. You may not have a lot of extra items, but even removing one casserole dish, three glasses from fast food restaurants, half the contents of the kitchen junk drawer, and those old kiddy plates and sippy cups your children outgrew years ago can free up a surprising amount of room, making it easier and more pleasant to put things away. It’s great if you can get rid of some big things, but just getting rid of little bits and pieces can shake free a surprising amount of space in your home and get you started on the path of downsizing and decluttering. Keep what’s most important and get rid of the dozens of items that are cluttering your home and your life. 12 Days of Back-to-School Giveaways: Day 6, Post-It Swag Bag! Yesterday, I got my husband to admit we needed to rent a dumpster. I am holding him to his promise and the day it actually shows up may quite possibly be one of the top three moments of my life mixed somewhere with my wedding day and the births of my two children. We keep one box specifically for donations to the local thrift store. As I go through a room, or a drawer, or a shelf in the linen closet, things that are not used regularly, do not have dual purposes (such as blankets and sheets), outgrown clothes, etc. get placed there and once a month or every couple months, gets taken to the thrift store. Our home is a little over 800 square feet and is easily cluttered…But don’t get me started on the hubby’s garage…LOL! I actually started “shaking the house” at the first of the year and began with Christmas decorations, then the kitchen. I’m just tired of the clutter. When my husband and I got married, we never took the time to compromise and pair down all our stuff combined. Christmas items went from 8 boxes – yes, 8 boxes of crap to include 2 artificial trees – down to a total of 5. The other 3 boxes of stuff are destined for a yard sale. It’s just stuff that I won’t put up anymore (um hello, ornaments from 1st marriage?) to rinky dink stuff given by different people. In the kitchen, I had 2 big blocks of knives. Since I use his more because it can go in the dishwasher, mine went into a box. I have a nice marble base cheese slicer, but we haven’t had anyone over besides family since lil man was born. An extra coffee maker and, since neither of us drink coffee, there’s not much point in having 2. I’m scared of some rooms, but it has to be done because the clutter just depresses me when it’s cleaning time. Anything that doesn’t sell at the spring yard sale will be trucked off to Goodwill or Teen Challenge Thrifts because it’s not coming back into the house. Soooo, what does a person do when… Every single item I pick up and decide to keep or not keep ends up staying because I have a survival use for EVERYTHING! Its driving me nuts but I just can’t do it. I completely agree with this article and know I am a terrible offender of these suggestions. But, I lost my job last week and once the dust settles and IF I have time after my daily job search, I fully intend to get on the stick and begin to “shake the house” myself. While job hunting in my priority, doing this will keep my mind off of the worry about being jobless for the time. Thanks for the kick in the pants about decluttering my home. It will be cathartic and keep my mind off of my situation, which is GREATLY APPRECIATED!! Howard, being active and taking on projects provides a sense of accomplishment and does take your mind off things like loss of a job. I’m glad you’re focused on finding positive ways to spend this time before your next job comes along. Once you do a major un clutter from kitchen to bathroom, it’s easier to go thru things every few months and donate to group homes or low income folks, missions, etc. Electronics can eb sold or donated to a private school or church. Retirees need to get serious about this, ask the kids or nieces, nephews to take what they want first like family items or jewelry , then sell, donate. It’s a continuing process and fun/motivating once caught up.